Everyone recognizes the importance of tactics to a player’s ultimate chess success. Richard Teichmann is famously (and often) quoted as saying “Chess is 99% tactics”. Although one might disagree with the figure he gave, no one in his or her right mind would ever completely dismiss the importance of tactics as a component of the successful player’s chess knowledge. But the realm of tactics is merely one such component. As some point in a player’s chess career, he or she is forced to admit that tactical prowess will only carry one so far and that one must learn to recognize the elements of the bigger, long term picture. This is the point at which a player begins to consider chess strategy: long-range planning, ideas, and structures — some of the elements which Wilhelm Steinitz bundled together under the categorical umbrella of “the accumulation of small advantages”. While strategy is very important to a player’s development and success, the corpus of instructive literature on this aspect of chess is smaller than that of tactics and is positively dwarfed by that related to the openings. That’s a shame; speaking from my own experience, I didn’t become an even halfway competent player until I began to study strategy. It’s for this reason that I’m always happy to see a new entry in the realm of instructional materials concerning chess strategy, particularly well-organized works which deal with the subject of structures. 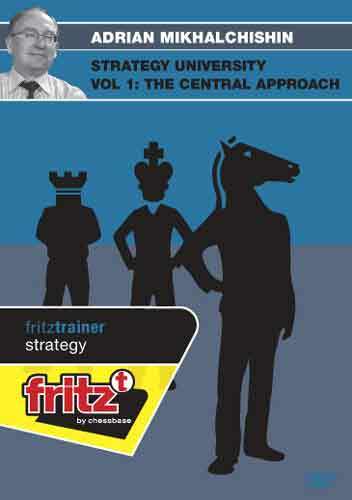 ChessBase has launched a new series of FritzTrainer DVDs under the blanket title of Strategy University (the title derived, no doubt, from the USA branch’s late lamented ChessBase University instructional disks to which I had the privilege of being an editor and contributor back in the 1990’s). (As a side note, I also appreciate that this disk also contains links to the individual games contained in the video instruction. While the video doesn’t play when a game is accessed this way, the user has access to the written annotations and variations contained in the game’s notation). 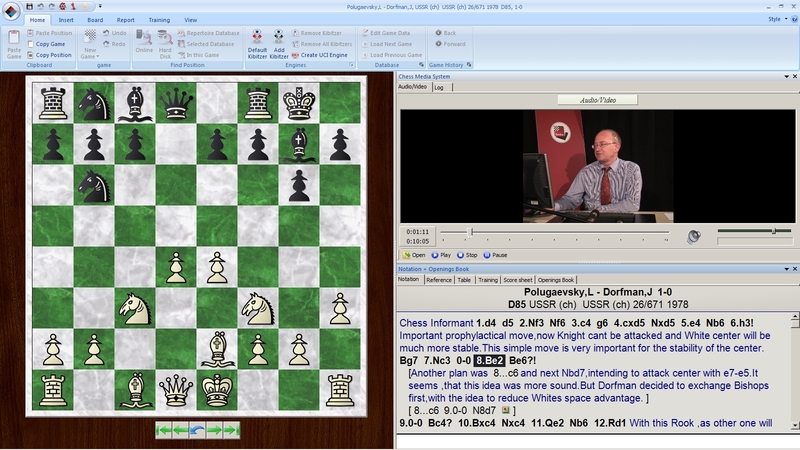 The subject matter of the DVD can easily be deduced from the DVD’s title; GM Mikhalchisin concerns himself with the center of the chessboard (and its related structures). But the disk doesn’t stop with the well-known matters of central occupation; in fact, there’s an assumption that the viewer has already encountered such a mundane concept elsewhere. This DVD launches straight into concepts such as indirect control of the center, central expansion, and (most usefully, at least for me) instruction on the proper times to break the central pawn structure (and the tension it conveys to the game) or to close it. The instruction is clear and well-presented (although some folks may find themselves needed to pay closer attention due to the instructor’s accented English; then again, paying closer attention to an instructional presentation is a good thing). The videos are generally short enough to not tax the users patience or attention span (ten to fifteen minutes is the norm, although you’ll find an occasional lesson which runs a bit past twenty minutes). And, as is the case with nearly all of the FritzTrainer DVDs, no additional software is required as a version of ChessBase Light/Reader comes with the product, ready to be installed. 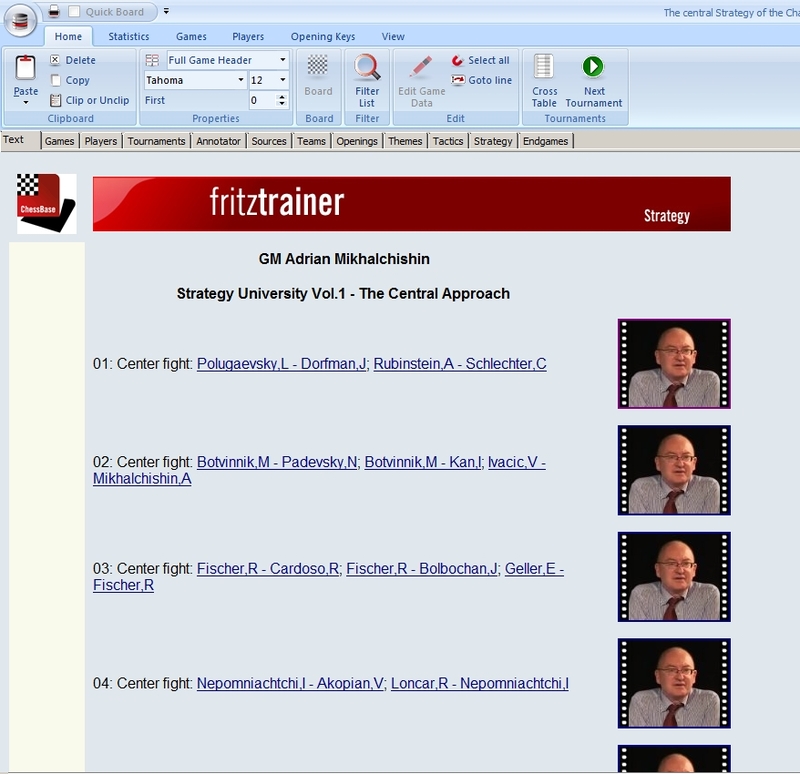 Strategy University Vol. 1: The Central Approach is in stock and ready to ship from USCFSales.com.